Update 10/03: Maureen Bryson of Las Vegas, Nevada, documented more art work on "the road to the river" on September 5, 2003. Californians in a hurry to put their speedboats into the water at Parker, Arizona, are familiar with Highway 62. 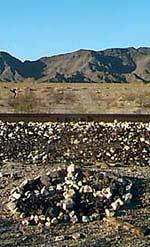 The flat stretch between Rice and Vidal Junction is paralleled by a railroad track, and if it weren't for a tradition inspired by the black rocks in its embankment, it would be just another lonely desert road, useful in its destination, but otherwise hardly worth a mention. Thanks to the efforts of that first Kilroy who once paused along this lonely road, a seventeen-mile stretch of Highway 62 has become a place to leave a mark, and countless travelers since that first one have paused long enough to spell names and messages with dark stones and bits of glass on the railroad berm. 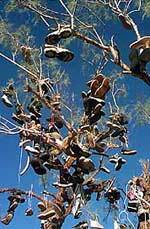 And then, as if greetings in stone weren't enough to set Highway 62 apart from its two-lane brethren, there's the Shoe Tree. The tree must have been a landmark before it earned its decorations, because it's the tallest thing for miles around. Now, festooned with hundreds of pairs of sneakers, sandals, hiking boots and every other kind of footwear known to man, it's, well, something even more special. Does it take three features to create a wonder? If so, Highway 62 makes the grade with its third roadside monument. 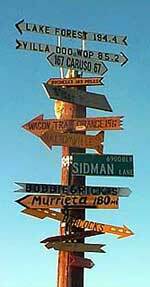 At the turn-off to Iron Mountain, there's sign that will tell you how to get to a remarkable number of places you've never heard of. Like the Shoe Tree and the railroad embankment, it's grown more colorful over time. By the way, if you like artistic roads in out-of-the-way places, click here to check out Nevada's Guru Drive.